When Multiverse pirates set their sights on advanced tech on Cerka space station, Amanda must enlist the help of Jessica and the starship Sabrina’s crew. The Multiverse is vast and infinite, filled with countless universes, each with powerful artefacts unique to their realm. These treasures are tempting targets for those who can travel between universes. Magus Amanda is recruited to help fight these pirates before they upset the multiverses fragile balance. Sent on her first mission, Amanda finds herself on Cerka Station in the middle of the Orion War, hunting for these plunderers of the Multiverse. Jessica and the crew of the starship Sabrina are on Cerka to quell growing hostilities between humans and AI’s, but their mission is interrupted by the arrival of Amanda. 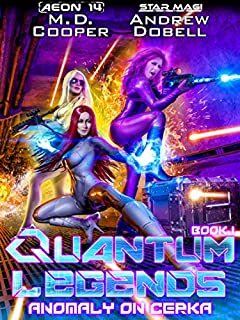 Amanda and Jessica must work together to stop the theft of valuable technology that could upset the balance of power elsewhere in the multiverse before it’s too late. Quantum Legends is a series of collaborations between Andrew Dobell and other authors, where Amanda from his Star Magi series visits other universes. In this book, Amanda visits M. D. Coopers Aeon 14 universe and works with Jessica and the crew of Sabrina.